Carl Edwards, driver of the No. 99 SUBWAY Ford, drives on track while other competitors wait on pit road during qualifying for the NASCAR Sprint Cup Series The Profit on CNBC 500 at Phoenix International Raceway. 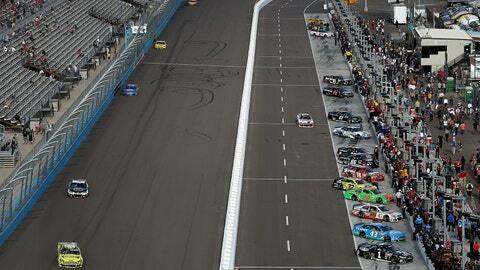 NASCAR’s first ever Sprint Cup knockout qualifying round took place without incident Friday afternoon at Phoenix International Raceway, where 46 cars duked it out for the pole for The Profit On CNBC 500. All 46 cars set times during the first 30-minute session, with the fastest 12 advancing to the 10-minute final round. The big winners on the day? That’s easy. Penske Racing swept the front row, with Brad Keselowski setting a new track record at 139.384 miles per hour, and Joey Logano second at 139.265 mph. Keselowski went out at the beginning of both sessions. Queried as to whether that was a strategic move, he said it wasn’t. "I just get bored sitting around," he said. "I can’t sit and watch other cars run, it drives me crazy. I got in the car and they asked if I wanted to wait or go and I had already fired it up and drove off. I am not a very patient guy. I felt that was the right thing to do, just go when you are ready and I was ready." Also looking good was the Chip Ganassi Racing with Felix Sabates outfit, a team that has struggled in recent years. But with Jamie McMurray qualifying third and his rookie teammate Kyle Larson eighth, the team looked strong. The Penske and Ganassi outfits were also strong in practice Saturday morning. Hendrick Motorsports acquitted itself well, in qualifying with Jimmie Johnson fourth, Daytona 500 winner Dale Earnhardt Jr. fifth and Kasey Kahne 11th. Only 17th-place Jeff Gordon failed to make the second round. Not everyone was as fortunate. Danica Patrick’s qualifying struggles continued, as she clocked in way back in 33rd position, which means she’ll have a huge challenge to post a good finish on Sunday. Martin Truex Jr., who qualified on the outside pole for the Daytona 500, was just 27th, and last year’s winner here, Carl Edwards, was a disappointing 23rd, one position ahead of Daytona 500 pole-winner Austin Dillon. The most hotly debated aspects of the qualifying centered around cooling. During qualifying, teams put tape over the radiator of their cars to increase front downforce and speed. The causes the engines to get hot, which in turn hurts power and longevity. Teams use cool-down units to cool the engines during practice. But those aren’t allowed under the new qualifying rules, so some drivers drove slowly around the apron of the track to cool their engines. And they did so while other drivers were going 100 mph faster trying to qualify. That created a spirited debate among drivers as to whether cooling units should be allowed on track. "We have to figure out a way to cool the cars," said Gordon. "You shouldn’t have to go ride around the track and try to cool it." NASCAR will continue to evaluate the process as the season continues, but that doesn’t mean they will necessarily change the rules to allow cooling units. "The reason that we don’t want the cool-down units out there, so far, is because we don’t want the hoods opened and other adjustments that could be made," said Robin Pemberton, NASCAR’s vice president of competition and racing development. "It’s management as much as it is anything. … We’ll continue to talk to the drivers and teams and solicit feedback." Overall, driver reaction was positive. "As far as the format I thought it was pretty interesting," said Earnhardt. "I think it was fun. I think the teams enjoyed it. My team commented that they all really enjoyed the process. I don’t know how it played out on TV or how it came across in the broadcast, but I thought it was pretty fun to be involved in it." "This qualifying format really does suit my style a lot better," said pole-winner Keselowski. "It gives me a chance to learn and apply which to me was instrumental to our success today and hopefully will be in how we go forward. It is interesting how a small format change like this can favor or disfavor teams and individuals and this is one that we have been able to take like a fish to water. Hopefully we will continue to do that."